Happy Fourth of July! If you're still looking for something to throw on the grill today, check out this post I did last year all about Fourth of July Menus from Rachael Ray. Another good option is Spicy Honey-Glazed Chicken and Orange-Scented Green Beans and if you are going to a potluck and the food will be outside for awhile, try this mayo free Balsamic Potato and Green Bean Salad. If you try a Rachael Ray recipe out for your celebration today, make sure you email me or leave a comment here to tell me how it turned out. We're celebrating my putting Darcy in a onesie that says "Little Firecracker" and hanging out in our air conditioned house! Karen at Busy Mamas made a recipe that's on my list to try - Grilled Beer Chicken with Potato Slabs from Every Day with Rachael Ray. AmyDe at Ignore Me - It's Easier includes a whole bunch of Rachael's recipes in her menu planning and answers some FAQs about Rachael's recipes. 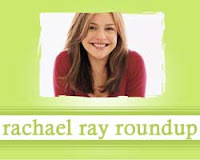 The Star-Telegram features a review of Rachael Ray's newest cookbook, Yum-O! The Family Cookbook. Sports Illustrated talked to Mario Batali about a contest his is sponsoring with Rachael Ray. Hostess with the Mostess shares some 4th of July ideas from Every Day with Rachael Ray. Please try my sister-in-law's Strawberry Rhubarb Pie. You can find it at http://poprs.blogspot.com/2008/07/tasty-therapy.html. BTW, Rachael's Yum-O is quite the cookbook!